Motorcycle Luggage - Have Bags, Will Travel! Motorcycle Luggage: Why do you even need it? I need motorcycle luggage because I like to travel on the motorcycle. I like to leave home in the early morning and arrive somewhere else in the evening. Without bags on my motorcycle, I'd not be as good a traveler. I wouldn't be able to take my hair dryer, changes of clothes, different shoes, make-up - you know, stuff. 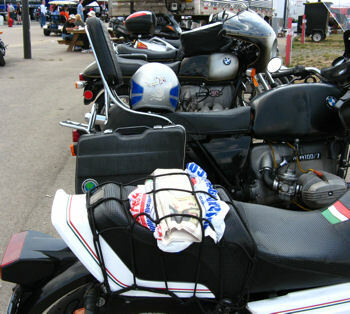 Fortunately, BMW motorcycles always have side bag mounts as an option, and hard bags to mount upon them. Most touring bikes have mountable bag systems, and I highly recommend them. If your bike has an option for motorcycle luggage, get them. Unless you only want to ride to the local coffee shop, at some point, you're going to want to take stuff with you. 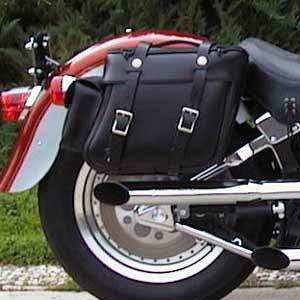 Even if you ride a bike without bag mounts, you still have options - there are many, many varieties of side bags that can be mounted under the seat. You can also do the ole' bungee net to the back end. The point is: You have options. An ingenious invention, a net comprised on bungee cords, that can confine a bunch of stuff to the back of your bike. If you don't have side bags, buy a net. But, other than side bags, the most useful type of motorcycle luggage is one that you can actually reach into while riding. (Well, don't try this until you feel comfortable, but when you are, you'll know). I truly believe that there is a tank bag that will fit any bike on the road. 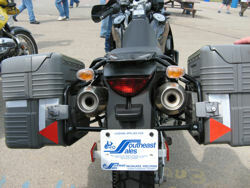 Magnetic bags, tank bags that attach with harnesses around the front of the bike; bags that attach with harnesses under the seat. 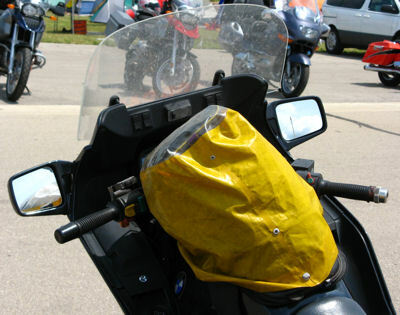 If you have a motorcycle, there is a tank bag for your bike. My tank bag is expandable, which is wonderful, especially due to the fact that I always return home with more stuff than I left with. I keep my purse in my tank bag, along with my camera, the IPOD, peanuts, money for tolls, a sweatshirt, gloves, a bandana, batteries...you know, stuff. 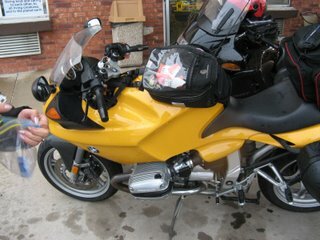 I used to believe that a tank bag would ruin the "look" of my bike - you know, it would be cheesy. Then I traveled without one, and my mind was forever changed. Tank bags are wonderful. My tank bag is also dual-purpose. When expanded, I can lay my torso down on the tank, with my head up, and stretch my back. I wouldn't recommend a nap, but a good back stretch is great during a long highway ride. If you are looking at a tank bag online, measure your tank, and know the year and model of your bike. 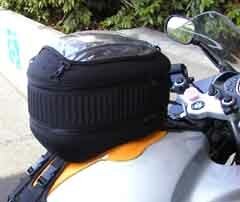 Any reputable dealer will be able to help you fit the right tank bag for your motorcycle. Here are some of my picks for motorcycle bags, tank bags and luggage. If you need more room for your stuff, after packing the side bags and the tank bag, then you should consider attaching a bracket to the back of your bike for a top bag. This is the ultimate motorcycle bag...and another bag for the stuff you need. 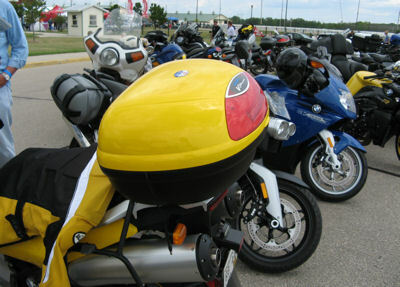 Some of the hard cases designed for the back of motorcycles are big enough to hold a helmet. 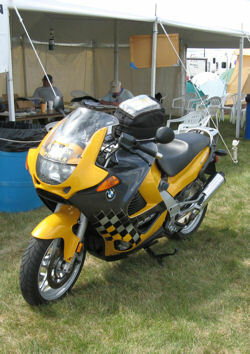 Most, if not all, touring motorcycles have the capacity for a hard case. If you are traveling a long distance, or if you have a lot of stuff, consider having a top case fit for your bike. Is there any reason, now, not to travel on your motorcycle? Look at the packing potential: side bags (2), tank bag, back bag, pockets in your jacket. Nothing better than a jacket with lots of pockets and some great motorcycle luggage...or and a great road or two. Now that you've got the motorcycle luggage, why not do some touring? Her-Motorcycle Forum Bikes Women Love To Ride Helmet Hair Motorcycle Advice Motorcycle Questions Riding 2 Up Safe Riding Why Do You Ride?